It is also engraved on the corner stone of Honolulu Hale, the Honolulu City Hall. Ua Mau ke Ea o ka ʻĀina i ka Pono is a well-known Hawaiian phrase which was adopted in 1959 as the motto of the state of Hawaii. It is most commonly translated as The life of the land is perpetuated in righteousness. This phrase was first spoken by Kamehameha III, the King of Hawaii, on July 31, 1843, on Thomas Square, Oʻahu, when the sovereignty of the Kingdom of Hawaii was returned by the British through the restorative actions of Admiral Richard Darton Thomas, following the brief takeover by Lord George Paulet. Today, the phrase is extensively used by both the state of Hawaii and by Hawaiian sovereignty activists. Some of the words contained in this phrase have greater, more difficult to define meaning than is commonly ascribed. Mau, for example, implies an unending continuation; Ea means not only "life", but "breath" and, more importantly, "sovereignty". Pono is a well-used Hawaiian word that cannot be concisely translated. It includes aspects of goodness, excellence, fairness, order, propriety, completeness, care, value, organization, purpose, and hope. It is disputed that the word ea in this pronouncement refers to "life." Many now insist strongly that ea refers specifically to sovereignty because of the circumstances at the time Kamehameha III uttered it. Thus, a possibly more accurate translation would be : "The sovereignty of the land is perpetuated in righteousness." Admiral Thomas did what was righteous (pono) by returning on that day the sovereignty of the Kingdom of Hawaiʻi to its people through handing it back to their king. ^ Hawaii State Legislature. 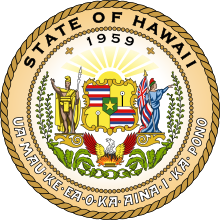 "Hawaii Revised Statue § 5-9 (State motto)". Retrieved October 7, 2016. This page was last edited on 25 April 2019, at 21:20 (UTC).